Jon, this is a great “outsider” view of the tango world, which he experienced by knowing Alberto and Valorie. Anytime someone dies, a library (of experiences) burns to the ground. But you have given reason to start the job of taking the most precious “books” from Alberto’s “library,” and piece together his immortal gifts for contribution to Library of the Tango Community. One of the reasons I don’t want to be a tango teacher is that God keeps taking tango teachers into heaven. The angles keep complaining that tango dancers on Earth seem to be experiencing a more wonderful heaven than they have. Heaven’s trying to catch up, and Alberto’s going to “give’m hell” (he was good at that too) if heaven’s residents try to do too many figures and start losing a warm heavenly embrace. There’s work to do, and heaven needs to trade in the harps for bandiones. Alberto is already having a discussion with DiSarli at a café over tango, both smoking heavenly cigarettes, making little puffy cloud 9´s. (Second-hand cloud 9´s are actually good for those around you). NOT R.I.P! It’s R.I.T. 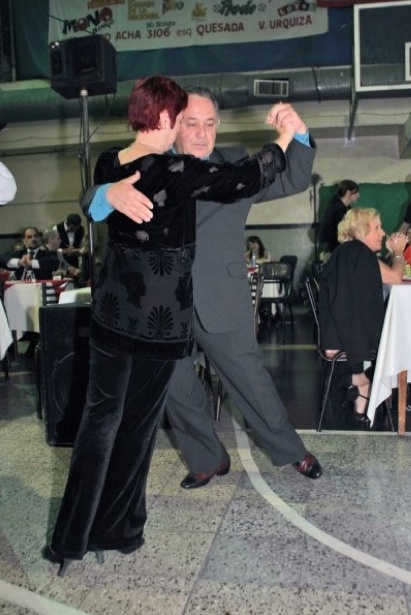 (remain in tango). R.I.T., and we will meet there again–with Alberto.